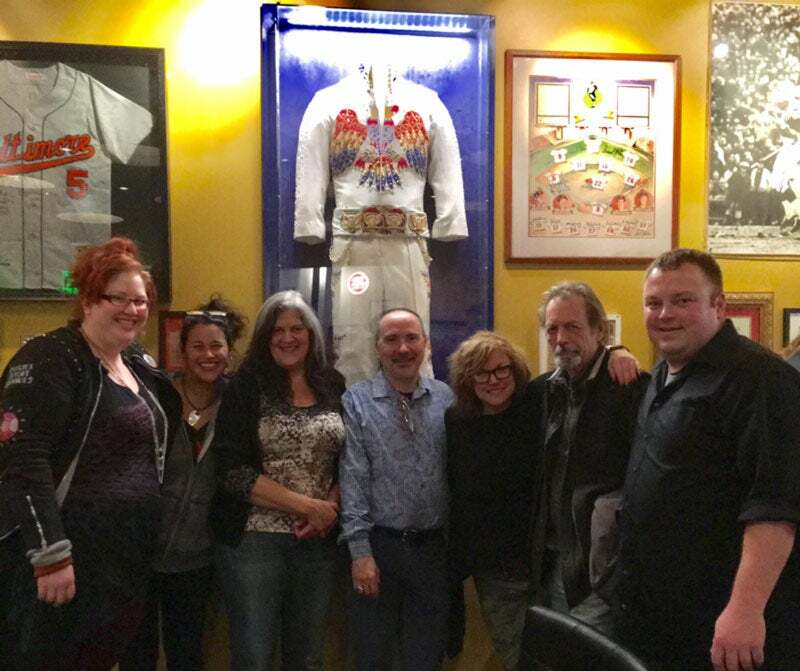 When Nacho Mama’s asked us to frame items for their new restaurant location in Towson[Maryland], we had no idea we would be involved in the framing of a genuine Elvis jumpsuit! 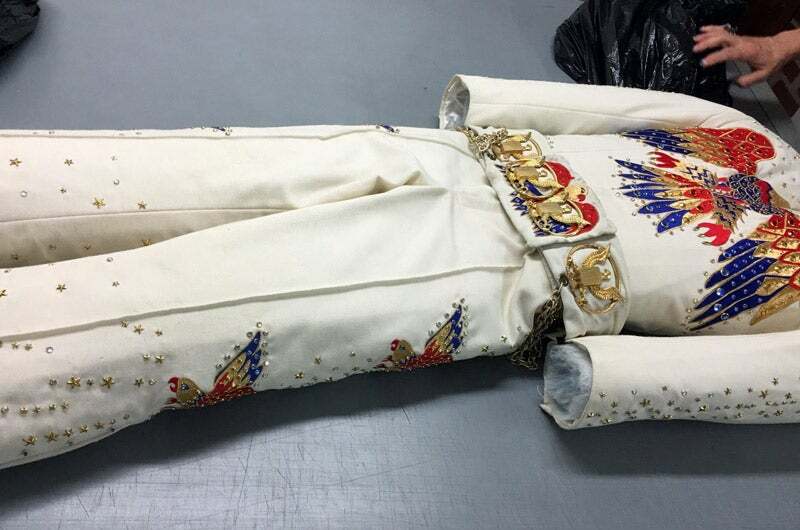 A stuntman wore this jumpsuit the movie Honeymoon in Vegas during the “Flying Elvis’s” scene. Our challenge was to frame this suit as a centerpiece for a space inside the new Nacho Mama’s [Restaurant]. We didn’t want an elaborate frame, as it would detract from the suit. Eventually we settled on a flat rectangular profile. We had the profile milled from Furst Brothers, and received it raw and unfinished so we could paint and color match the frame to the blue suede fabric. As the design discussion continued between Carolyn and Allison, Nestor and I started discussion on how to functionally build this frame. The piece needed to be recessed in the wall, so the suit and enclosure had to be able to carry its own weight, as well as be visible from all sides as it protrudes from the wall. In addition to those specifications, there had to be lighting on the Elvis jumpsuit as well. Our immediate solution was to use an acrylic box. The box would measure in at 30 inches wide, 70 inches tall, and 8 inches deep. The wall opening was only going to be 3.5 inches deep, so there would be a lot of this piece sticking out from the surface of the wall. Considering the weight of all the components, we knew we had to go with 2 sets of Z-bar wall brackets. For the lighting, the Nacho Mama’s team originally wanted to have an opening cut out of the enclosure to allow for a light fixture. Knowing there was nothing actually installed in the rabbet of the frame, I asked about switching to LED-strip lighting instead of using a light fixture. After measuring the typical frame rabbet, we knew there were a few LED lighting options the architect could choose for this application. LED is a great choice for some jobs because it won’t heat up the Plexiglas enclosure and overheat. We went with an option that doesn’t cut into the enclosure, but rather rests on the inside of the frame, barely touching the Plexiglas, protecting the suit in the enclosed box. The structure under the blue suede fabric had to be rigid and meet a few specifications. First, it had to be flat on both sides. We knew stretcher bars couldn’t be used in this application because the raised-edge stretcher bars would have to keep the canvas off the rest of the face of the stretcher bar. We used a 2.5 inch by 1.5 inch poplar wood, which is structurally strong. We wrapped the blue suede fabric around a mat cut to the 30×70 inch dimensions we decided on early, allowing extra length to cover the substrate structure. We also needed a light and structurally sound surface to hold the fabric-wrapped mat and suit in place. We went with a sheet of Coroplast, which is a corrugated plastic (fluted polyvinyl) product. This is a chemically inert, additive free, and archival-grade plastic. So all we had to do was sandwich the substrate pieces together! 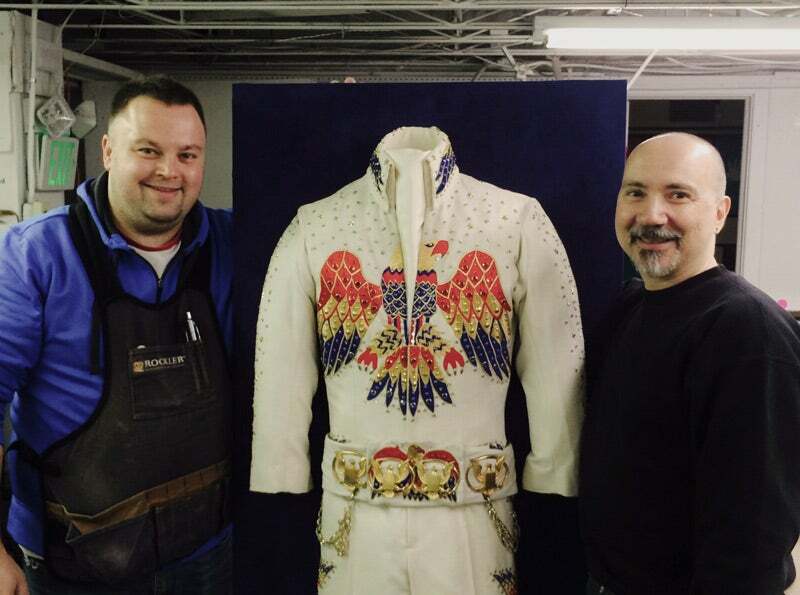 Tony was a huge help in mounting the entire suit to the blue suede fabric-wrapped substrate. He used a combination of the Attach-EZ plastic fasteners and thread to fully mount the suit into position. Numerous stitches were strategically placed all over to provide strong structural support as well as keeping the stitching hidden from view. The suit already had stuffing inside when we received it, so all Tony had to do was properly position it to look as though the suit were draped over a body in air. The frame took several coats of white gesso with sanding between layers, then a final coat of Montana Gold paint in blue to match the suede and a coat of clear varnish to seal the frame. This process of painting took a lot of patience and Carolyn was up for the task! After many layers it all came together beautifully. As I mentioned before, this jumpsuit framing job was going to be recessed into the wall, in a Plexiglas enclosed case. One of the concerns that was raised was being able to see behind the drywall, through the enclosure. To remedy this issue, we took long strips of balsa wood, painted them with gesso, paint, and varnish to match the frame, and adhered them onto the inside of the rabbet on the sides and bottom of the frame. The depth of these strips were 3 inches; just enough to slide into the wall without hitting the back side of the opening, but also reaching past the fabric-wrapped substrate we built. The frame functionally acts as a decorative escutcheon to the wall around the enclosure. It hides the rough wall openings, allows for readjusting if needed, and functions as a completion of the decorative elements in the entire design. All-in-all, this fun project took a team effort of skills to provide a beautiful product that our new clients are extremely happy with and proud to display in their new restaurant. Good description, but I’ve seen the results in person in Towson & the pictures here don’t do it justice. Great work!! Thanks Sawdust! Photos were kind of an afterthought. I’m just starting to learn about documenting my projects as I go. I appreciate the love.